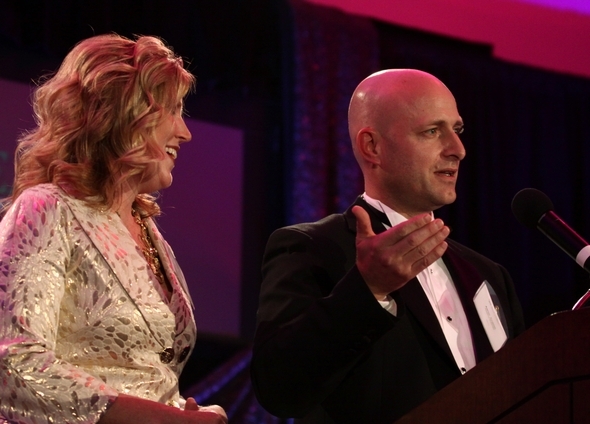 Posted on Sat, Nov 5, 2011 : 9:53 a.m.
Michelle and Aaron Crumm "combined the heart of an entrepreneur" with technology skills as part of their success, Deals of the Year presenter David Parsigian said Friday night during the awards ceremony. Vision, passion and perseverance drove the success behind this year’s Executive of the Year winners at the 7th annual Deals of the Year. The three traits united to cultivate not just a company and not just a goal, but the type of effort that fueled a $23 million sale of Adaptive Materials Inc. after years of innovation to fill an unmet market need. Yet in accepting the award, the Crumms told the crowd that while they were proud of their hard-fought results, they also appreciated what it meant for Ann Arbor. They received advice and support from mentors in the business community and now try to return that. And that’s what can fuel more innovation and more business success in an region that continues to set an example for Michigan. “This is a success story for all of Ann Arbor,” Michelle Crumm said. That element of generating further success was a constant theme at this year’s Deals of the Year, which drew a crowd of about 375 to the Eastern Michigan University Student Center. The event is sponsored by AnnArbor.com. “We’ve spent too much time being too negative,” he said. That won’t stop until the state stops encouraging businesses, communities and residents to have a “win-lose” mentality and turn toward a forward-looking, inclusive and collaborative environment. Those elements are found in Ann Arbor, he said, and many in the room were responsible for that. The people at the seats “are at the heart of reinventing Michigan,” Snyder said through core attributes of teamwork and partnership. A total of 16 awards were presented Friday, including seven companies that earned the “Fast Track” designation from Ann Arbor SPARK and seven sectors receiving “Deals of the Year” trophies. Also presented was the award for Company of the Year, which went to ForeSee. Presenter Michael Finney, CEO of the Michigan Economic Development Corp. , noted that the success of the company reaches across the U.S. due to national clients and its growth has led to more than 200 jobs - with more to be added. In the meantime, he told the crowd, he said they had a choice, too. He encouraged them to pursue "events of action." “We really only win together,” Snyder said. Sun, Nov 6, 2011 : 11:27 a.m. Sat, Nov 5, 2011 : 2:31 p.m. This piece of 'reporting' leaves me knowing so very very little about what happened, it's truly amazing... Plus, is the Snyder quote really correct, about the state needing to *stop* encouraging businesses communities and residents to lose the 'win-lose' mentality? I'm confused... And this reads like a blurb on a facebook page for the event, directed at those who already know all about it because they attended.